Do you want to perform multi-tasks with your carpentry axe and become an efficient carpenter? If Yes, Make sure your tool is made of good quality materials and is suited to your needs. However, it is not that much easier to choose the best carpenters axe that meets your needs, and this fact often makes woodworking people confused and leads to a wrong decision. So it is wise to gather few important ideas about your desired tool before making a purchase decision. If this is the problem you face too like many people, this review is meant for you that will help you obtain the best one from a wide variety of axes. We reviewed top branded axe like husqvarna carpenters axe, gransfors bruks, estwing, hults bruk. Here are the things you should look for to make the price for your tool worth paying before you buy a carpentry axe. Unquestionably, Gransfors Bruks Carpenters Axe is one of the best carpentry axes that offer a thin and straight blade, allowing you an opportunity to make smooth and perfect cut in dry wood. You can slice heavy wood with this tool as it has an 18 inches long handle with a straight shape, suitable for all grips. All it takes is only one or two strokes to work through heavy wood thanks to it's 3.5 inches wide face. So it is needless to say that this tool consumes less energy for the same work done with other axes. Maybe you are looking for an axe that can be used as a heavy knife and a hammer as well. If so, this carpentry is intended for you as it functions like a good heavy knife, and the ground pole of this axe works as a hammer. Do not get worried about the protection of your tool because GransforsBruk Carpenter’s hatchet comes surprisingly with a nice sheath cover that is enough to prevent damages to your favorite tool. If you plan on purchasing an ax that can compete with all types of heavy cutting, you are going to choose Estwing Carpenter's Hatchet, meaning that it is best suited for professional woodworking people like carpenters, log builders, woodworkers, constructors, framers, and roofers. 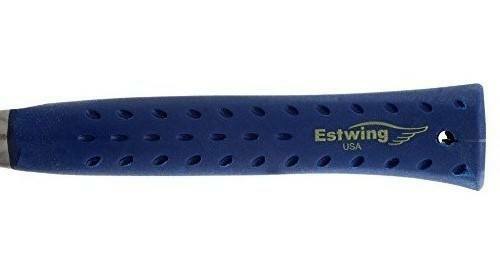 This tool is the most durable thanks to the finest American steel used in it as raw materials. One of the most distinguished features of it is that the head and edge are forged into one piece, which makes this tool long lasting. It features shock reduction grip to reduce vibrations caused by impacts, offering both comfort and durability. To ensure the maximum comfortable finish, the head and handle are fully polished. The handle is 13 inches in length and is strong enough to strike the hardwood while the cutting edge is 3.625 inches. Keep in mind it does not come with a protective cover but such cover is available on the market. However, I think serious carpenters will enjoy this excellent ax as it is suitable for traditional woodworking and heavy construction duty. Husqvarna 26" Wooden Axe is definitely meant for you if you are looking for an ax that can compete with different kinds of works rather than specific ones. This versatile hatchet works great for wood chopping, tree felling, splitting of firewood, and many other jobs. In a traditional style, it comes with a 19 inches long handle, providing an added power required to cut perfectly. The handle is made of hickory with a curved shape to provide hard grip and can be used with both two and one hand. Using both a wooden and steel edge to ensure secure fastening, the head is attached to the handle firmly. Its head is made of hand forged-steel that can limb not only fallen trees but also split trees around the camp and garden. Last but not least, it comes with a leather edge cover to protect from unwanted damage. It would be the great choice of the century for its price as a heavy hatchet for woodworkers and professional carpenters wishing to work with this excellent axe for years. It comes with two special features which make it different from other axes. To begin with, the head of this tool features a tempered zone to keep the edge extremely sharp even after unlimited times use. Besides, the steel used in its head is produced with hand grinding process, meaning that the steel is struck for multiple times to increase the density thus making the axe more durable. Hults Bruk has a narrow long edge with a perfect straight shape and a handle with medium length. The head weighs 1.75 Lbs while the handle lengthens 20 inches. With a view to ensuring safety and protection, it offers a traditional protective cover. Thanks to above mentioned special features it possesses, HultBruk has become favorite axe for any woodworker. You must find yourself enjoying your work with this tool even more as the handle is treated with linseed oil. If you are about to buy a carpenter axe, this guide is for you that will help you know the things you should give a consideration to when selecting an axe. It is very wise to make your money worth paying for your tool but this is not an easy work at all. Here are some important factors you need to take into account to get your desired axe and to make the price valuable. The first and foremost important thing that you must consider when selecting a carpenter axe is its weight. It is always recommended for experienced carpenters to use axes having heavy head due to the fact that axes with heavy head produce more force. But axes which weigh less than five pounds are advisable for the beginners because it may be difficult for them to control swing accuracy, using the heavier axe head. For efficient cutting, you must give a consideration to the length of the handle. Although using a longer handle helps you swing with more force it is better to use a shorter handle than you need because it's easy to control shorter handle. more force, you can go with an ax having longer handle. What you need to prioritize when choosing a carpenter axe is the thing made it with. It is needless to say that both the quality and the durability of an axe often depend on the materials used in it. Generally, handles are made from either plastic or wood. It is better to go with the wood, especially hickory. And the heads are mostly made of steel, which does not matter of consideration. But do not forget to take a close look at the brand of steel. Portability is another considerable thing which is related to weight and length of an ax. The heavier and longer the axe, the harder is it to carry with. If you intend to buy a carpenter axe as home tools, and you are not going away from your home, portability is not the matter of fact. But it matters most if your workplace is far from your home; you must choose an axe that has shorter handle and lighter weight. Last but not least, what you should consider for an axe mostly depends on end use. If you ask yourself what you would like to buy a carpenter axe for, you will find the things to consider. For example, if you are a professional carpenter, your first priority should be the quality and the efficiency regardless of thinking about the size. For an occasional woodworker, size and portability should be considered first. Depending on your needs, there are many things to consider before purchasing an axe. Of all, above-mentioned factors are enough to consider, which will help you make your tool long lasting, even you will be able to handle it to your next generation. So, do not forget to spend few times considering important things to find the best carpenters axe.